What are you doing with that patch from my jersey? THIS is the finger I will use to top the Odell Beckham Jr. catch! BOO-YAH! I Want You to watch the 2nd IceBowl and see me dominate the game! I will not say Cheese, how about Fromage?!?!?!? We want you…for the Green Bay packers. Hey give me that sweater! This place is cold! When I Lambeau Leap you better catch me! I’m pointing at you. Wait… three fingers back at me… Damn! I can disco dance like no other! …and on this finger is where I’m gonna put my other Super Bowl ring!!! Buy Upper Deck or else! I’m not pointing fingers or anything but I want you to give me back that part of my rookie jersey. Dis is my favourite pose, I like to point da finger and feel fierce. Yes look at me being fierce! There will be no cowboy riding this weekend, go pack. Remember when I asked for your opinion, yeah, me neither! I want that Cowboys jersey! See that jersey it’s going to be worth a lot of money one day thanks to upper deck!! Hey YOU! 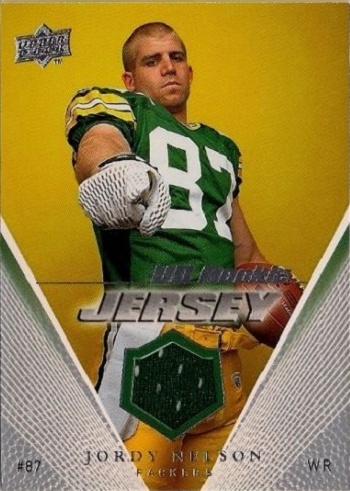 You’d also be “green” with envy if you had an Upper Deck Jersey card to chase after. You better not drop me when I do my Lambeau Leap! Can you help me with my powerpoint presentation? You have something on your…no a little to the left. There it is. Congrats to Brian G.! Your witty comment has scored you 5 packs of 2014 SP Authentic Football. Thank you to everyone for participating and we hope to see your comments again soon on the Upper Deck blog.